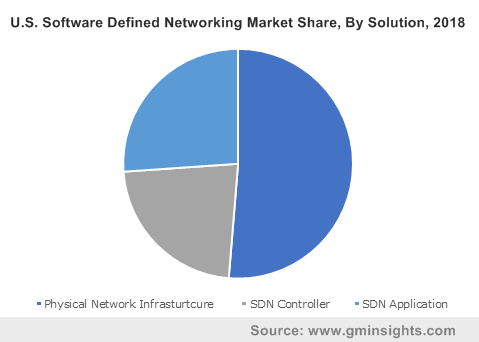 Software Defined Networking (SDN) Market size was estimated to be over USD 8 billion in 2018 and is estimated to grow at a CAGR of more than 40% over the forecast timespan. The explosion in the number of mobile devices and server visualization along with the advent of cloud computing technologies are forcing enterprises to reexamine their conventional network architectures. Most of the traditional network architectures are hierarchical and built on tiers of Ethernet switches. The design of these networking frameworks is ill-suited to cope with dynamic computing and storage needs to today’s enterprise networks. This has forced companies to adopt new and advanced networking technologies such as SDN. SDN solutions have a dynamic and flexible network architecture that can respond to constantly-changing business and end-user & market requirements. Moreover, the aggressive efforts by the telecom service providers to address the challenges of the traditional network is developing myriad new avenues for the software defined networking market. Over the past five years, telecom service provides are aggressively looking for the new technologies that come out of the collective efforts of the open source community and industry. They have been testing solutions from the Open Platform for NFV project (OPNFV), OpenStack/KFV ecosystem, Open Network Operating System (ONOS) and OpenDaylight projects. These efforts fuel the adoption of next generation networking technologies such as SDN to improve the efficiency, flexibility, scalability and programmability of the telecom network. The lack of standards for full device control is hindering the adoption of SDN technologies. The OpenFlow framework is the most commonly used standard in the SDN landscape. The framework has a unidirectional forwarding table update protocol, which determines the status of connected devices. However, the OpenFlow framework cannot accomplish a basic device setup, limiting its compatibility with various existing traditional networking technologies. Furthermore, its inability to provide full device control, which is a prerequisite for most of the networking systems is restricting the SDN market growth. The physical network infrastructure market is expected to account for over 50% in the software defined networking market. The market growth is attributed to its capabilities to manage and orchestrate the flow control among different network elements and applications. The SDN controller market is estimated to attain a growth rate of over 41% over the forecast period owing to the advances in the southbound & northbound interface and associated orchestration and management layers. Furthermore, the increasing deployment of SDN architectures for augmenting the safety of the network is also predicted to drive the demand for SDN controllers. Professional services are anticipated to dominate the market with a revenue share of over 70% in 2018. This is attributed to the rising deployment & integration of the solutions among enterprises, telecom service providers, and cloud service providers. Furthermore, the surge in the demand for inexpensive and efficient services to reduce the operational expenditure has also supported professional services market growth. The managed services are predicted to witness substantial growth over the projected time period. This is attributed to the increasing adoption of managed services for traffic engineering and network analytics applications among enterprises and service providers. Enterprises are dominating the end-use landscape in the software defined networking market with a revenue share of over 45% in 2018. The organizations adopt SDN solutions to augment the scalability & flexibility of their network infrastructure. Furthermore, the benefits presented by SDN solutions such as centralized management, improved automation, increased network reliability & security, and enhanced user experience are some of the primary factors promoting the use of SDN solutions among enterprises. 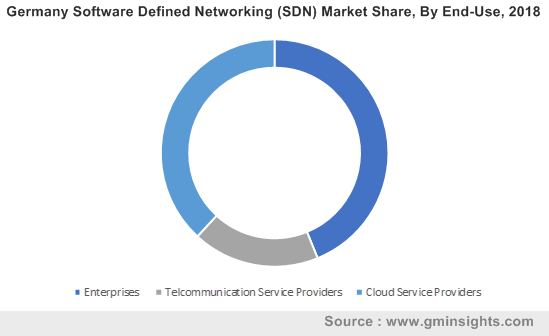 The telecom service providers segment in software defined networking market is anticipated to grow at a CAGR of over 41% over the forecast timespan. Telecom service providers are using the SDN technology, particularly for orchestration tools such as controllers, to provision their infrastructure and services after their network functions have been virtualized. The significant improvements in the cost and agility of SDN solutions are also encouraging their use among the providers. It also allows them to offer next-generation features such as on-demand advanced malware protection and cloud-based URL filtering. IT-enabled service led the enterprise market and accounted for over 30% market share owing to the increasing adoption of SDN solutions among enterprises to enable on-demand provision of network and its services. It reduces the complexity to decouple the control and data planes while making automation highly secure and scalable. It leverages on various open APIs to enable faster deployment of its applications and enable seamless integration with various third-party solutions. The North America region held more than 40% share in the SDN market. The presence of advanced connectivity infrastructure and a high level of proliferation of various mobility solutions are helping the market. The telecom providers in the region are investing in advanced networking technologies to improve infrastructure capabilities. For instance, AT&T, a telecom provider, has invested approximately USD 200 million in startups working on SDN technologies. The high degree of internet penetration and extensive adoption 4G technologies have also contributed toward software defined networking market growth. 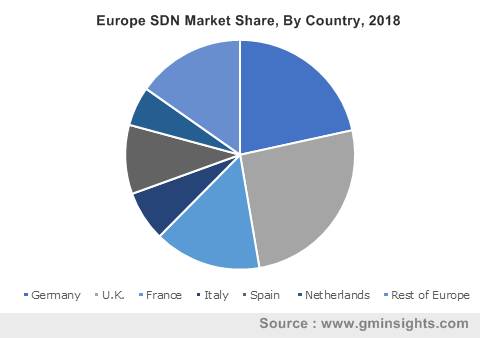 The Europe software defined networking market is expected to grow at a CAGR of over 40% between 2019 to 2025. The increasing use of cloud-based applications and advanced networking technologies across various industry verticals will drive the adoption of SDN solutions. The surge in data traffic, the advent of 5G, and the increasing adoption of IoT technologies are encouraging enterprises and service providers to incorporate SDN architecture into the networks. 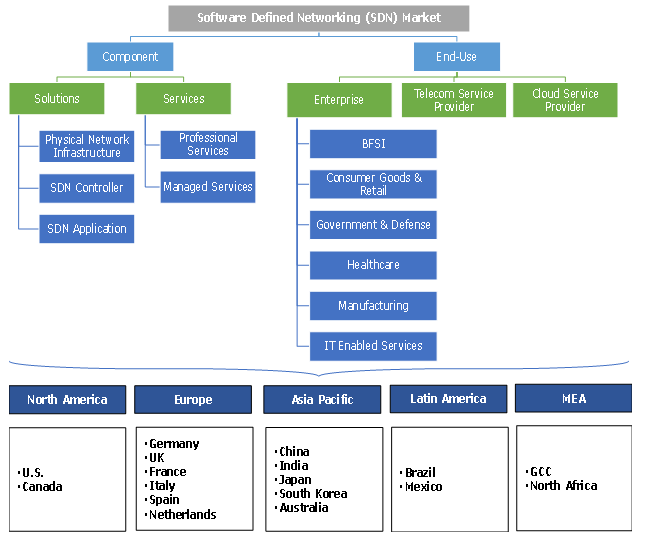 The SDN market includes many players ranging from major telecom service operators to the start-ups. The large companies, particularly from the telecom industry, are keen on acquiring start-ups working on SDN technology. They are focusing on integrating various open source SDN platforms with their cloud computing platforms to better optimize and customize their network infrastructure. Some of the major vendors in the market are Cisco, HP, Intel, Big Switch Network, AT&T, Pluribus, Pluribus, and Plexxi. Huawei, NEC Corporation, Pics8, Extreme Networks Juniper, Arista Network Intel, and IBM. The players are also adopting various inorganic growth strategies such as mergers & acquisitions and partnerships. For instance, in 2017, Broadcom Ltd., a semiconductor developer, acquired Brocade Communication Systems to solidify its position in the market. SDN is a networking architecture, where the network management is decoupled from forwarding and offers a programmatically effective network configuration to augment network performance. It emphasizes on delivering an open interface that assists in the development of the software to control the flow of data traffic between the network resources. The increase in mobile devices, extensive proliferation of cloud-based services, and server virtualization are among the major trends affecting the SDN market. The traditional networking solutions were widely used when the client-server computing was dominant. However, these solutions are static and unable to keep up with the increasing demand for dynamic computing and storage requirements. To address these challenges, advanced networking technologies are used across various business verticals.